How do we tell if a player has beat the high score? How can we tell if he has run out of lives? How can we tell if she has the key required to open the locked door? What we need is the if statement. The if statement is also known as a conditional statement. (You can use the term “conditional statement” when you want to impress everyone how smart you are.) The if statement allows a computer to make a decision. Is it hot outside? Has the spaceship reached the edge of the screen? Has too much money been withdrawn from the account? A program can test for these conditions with the if statement. Here are a few examples of if statements. The first section sets up two variables (a and b) for use in the if statements. Then two if statements show how to compare the variables to see if one is greater than the other. Press the “Step” button and see how the computer evaluates the code. Since a is less than b, the first statement will print out if this code is run. If the variables a and b were both equal to 4, then neither of the two if statements above would print anything out. The number 4 is not greater than 4, so the if statement would fail. 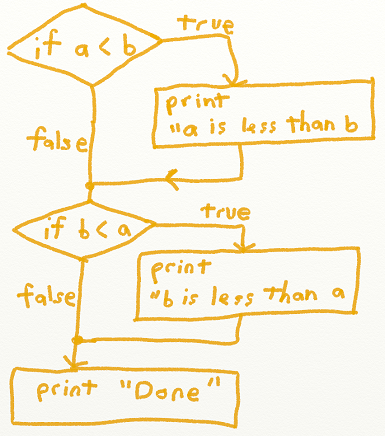 To show the flow of a program a flowchart may be used. 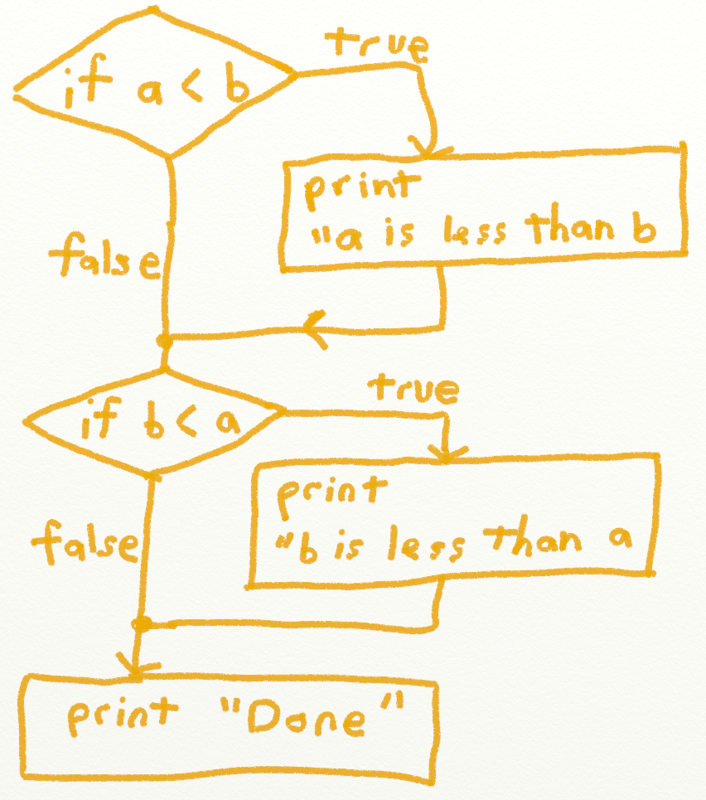 Most people can follow a flowchart even without an introduction to programming. See how well you can understand Figure 3.1. The <= and >= symbols must be used in order, and there may not be a space between them. For example, =< will not work, nor will < =. This ≤ symbol doesn't actually work in a program. Plus most people don't know how to easily type it on the keyboard. (Just in case you are curious, to type it hold down the 'alt' key while typing 243 on the number pad.) So when writing out code, remember that it is <= and not ≤. Many people lose points on tests for this reason; don't be that person. The next set of code checks to see if two items are equal or not. The operator for equal is == and the operator for not equal is !=. Here they are in action. Learn when to use = and ==. It is very easy to mix up when to use == and =. Use == if you are asking if they are equal, use = if you are assigning a value. Stop! Please take a moment to go back and carefully study the last two code examples. Save time later by making sure you understand when to use = and ==. Don't guess. Indentation must be the same. This code doesn't work. Once an if statement has been finished, it is not possible to re-indent to go back to it. The test has to be performed again. An if statement can check multiple conditions by chaining together comparisons with and and or. These are also considered to be operators just like + or - are. A common mistake is to omit a variable when checking it against multiple conditions. The code below does not work because the computer does not know what to check against the variable c. It will not assume to check it against a.
Python supports Boolean variables. What are Boolean variables? Boolean variables can store either a True or a value of False. Boolean algebra was developed by George Boole back in 1854. If only he knew how important his work would become as the basis for modern computer logic! An if statement needs an expression to evaluate to True or False. What may seem odd is that it does not actually need to do any comparisons if a variable already evaluates to True or False. # Boolean data type. This is legal! Back when I was in school it was popular to say some false statement. Wait three seconds, then shout “NOT!” Well, even your computer thinks that is lame. If you are going to do that, you have to start with the not operator. The following code uses the not to flip the value of a between true and false. It is also possible to use Boolean variables with and and or operators. Who knew True/False could be hard? It is also possible to assign a variable to the result of a comparison. In the code below, the variables a and b are compared. If they are equal, c will be True, otherwise c will be False. # This next line is strange-looking, but legal. # a and b are equal. Zero means False. Everything else is True. The code below will not print out anything because the value in the if statement is zero which is treated as False. Any value other than zero is considered true. In the code below, the first if statement appears to work. The problem is that it will always trigger as true even if the variable a is not equal to b. This is because b by itself is considered true. # This is a better way to do the if statement. Below is code that will get the temperature from the user and print if it is hot. If the programmer wants code to be executed if it is not hot, she can use the else statement. Notice how the else is lined up with the i in the if statement, and how it is followed by a colon just like the if statement. In the case of an if...else statement, one block of code will always be executed. The first block will be executed if the statement evaluates to True, the second block if it evaluates to False. It is possible to chain several if statements together using the else...if statement. Python abbreviates this as elif. In the code below, the program will output “It is hot outside” even if the user types in 120 degrees. Why? How can the code be fixed? If you can't figure it out, see the video. It is possible to use an if statement to check text. The prior example will only match if the user enters “Paul”. It will not work if the user enters “paul” or “PAUL”. A common mistake is to forget the quotes around the string being compared. In the example below, the computer will think that Paul is a variable that stores a value. It will flag an error because it has no idea what is stored in the variable Paul. This is because any value other than zero, the computer assumes to mean True. So to the computer "Mary" is the same thing as True and so it will run the code in the if statement. If the program needs to match regardless as to the case of the text entered, the easiest way to do that is to convert everything to lower case. This can be done with the lower command. The example below will take whatever the user enters, convert it to lower case, and then do the comparison. Important: Don't compare it against a string that has uppercase. If the user input is converted to lowercase, then compared against uppercase letters, there is no way a match can occur. # NOTE: It is very easy to mix when to use == and =. # if you are assigning a value. # This will not trigger as true because it is zero. # Comparing variables to multiple values. # trigger as true even if the variable a is not equal to b. # This is because "b" by itself is considered true. # This is the proper way to do the if statement. # Something with this is wrong. What? # end. It works fine under IDLE.